Europe, which includes 50 countries and territories, has about 38 million Muslims, constituting about 5% of its population. European Muslims make up slightly more than 2% of the world’s Muslim population. Readers should bear in mind that estimates of the numbers of Muslims in Europe vary widely because of the difficulty of counting new immigrants. 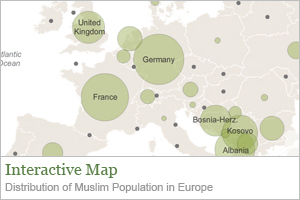 Nevertheless, it is clear that most European Muslims live in eastern and central Europe. The country with the largest Muslim population in Europe is Russia, with more than 16 million Muslims, meaning that more than four-in-ten European Muslims live in Russia. While most Muslims in western Europe are relatively recent immigrants (or children of immigrants) from Turkey, North Africa or South Asia, most of those in Russia, Albania, Kosovo, Bosnia-Herzegovina and Bulgaria belong to populations that are centuries old, meaning that more than six-in-ten European Muslims are indigenous. Despite the limitations of the underlying data for Europe, it appears that Germany is home to more than 4 million Muslims – almost as many as North and South America combined. This means that Germany has more Muslims than Lebanon (between 2 million and 3 million) and more than any other country in western Europe. This also puts Germany among the top-10 countries with the largest number of Muslims living as a minority population. While France has a slightly higher percentage of Muslims than Germany, this study finds that it has slightly fewer Muslims overall.1 The United Kingdom is home to fewer than 2 million Muslims, about 3% of its total population. * Data for Germany, France and Bosnia-Herzegovina come primarily from general population surveys, which are less reliable than censuses or large-scale demographic and health surveys for estimating minority-majority ratios (see Methodology). As a result, the percentage of the population that is Muslim in these three countries is rounded to the nearest integer.Note: Figures may not sum to totals due to rounding. Roll over a country bubble to see its estimated 2009 Muslim population, the percentage of its population that is Muslim and the percentage of the world Muslim population it represents. 1 This report estimates that France’s Muslim population is between 3 million and 4 million based on recent immigrant data and a 2005 Generations and Gender Survey projected forward to 2009. Other sources, including the U.S. State Department, CIA World Factbook, World Religion Database and general population surveys, have variously estimated the Muslim population of France at between 2.5 million and 6 million. 2 Figures for Italy come from the 2004 European Social Survey. Similar estimates were found in other general population surveys, including the 2002 and 2007 Pew Research Center’s Global Attitudes Projects surveys. However, other sources have variously estimated Italy’s Muslim population at between 30,000 and 1.5 million.